Local readers: Swiftkick is giving away free pairs of socks to people who download a coupon and bring it into participating Fleet Feet Sports and Runner's High 'n Tri stores until April 19th. Just download your coupon for a free pair at bit.ly/12bMgWB and take your coupon to your favorite Swiftkick dealer. I love my long compression socks so I'm excited to try a pair of these out! I just looked back at my blog posts from the beginning of March to see if I had a good excuse for not posting a February recap and new March goals, but all I could come up with is I was still recovering from my vacation. Even though I was back from vacation for about 2 weeks before the end of March, I am still going with that reason. February was a short month so there is that as well. I had a hard enough time completing all these goals in two month's time so it's a good thing I skipped March. Before we get to April (which btw, is my favorite month of the year-mostly because it's the month of my birthday), let's recap February goals. Goal 1. Spend out on vacation. CHECK! This goal went really well. I was able to enjoy all our dinners and sight seeing without freaking out about the prices. Of course it helped that Matt and I took turns picking up the bills so I never felt like I was spending gobs of money. Finding the balance between saving and splurging will continue to be a work in progress for me. Goal 2. Use the foam roller after every run. CHECK! I succeeded in this about 85% of the time. If I didn't have my foam roller, I would try to spend some time stretching out really well, but I wasn't perfect with that either. This was especially true if I ran in the morning before work and was running late. I also learned that I need to continue stretching throughout the day. Most days at work, I spend several hours sitting at my desk. My legs might feel good at the beginning of the day, but they tend to stiffen up really quickly after a few hours of sitting. Standing and walking around throughout the day really helps with the soreness and stiffness. Goal 3. Get back in the pool. eh. I swam once in March. That's it. Looking at potential half marathons for this year didn't seem to motivate me either. Swimming is such a great cross training workout because it is very low impact on the legs and helps build my endurance. As marathon training slows down, I am hoping to increase swim training. Goal 4. Ski one whole day in Park City without falling over. CHECK! Woohoo! On our very last day I did not fall down even one time, although I came close more than once. Matt did fall down getting off the ski lift which was pretty hilarious. Especially because I was behind him and got to watch the whole thing and it sort of looked like he was moving in slow-mo. 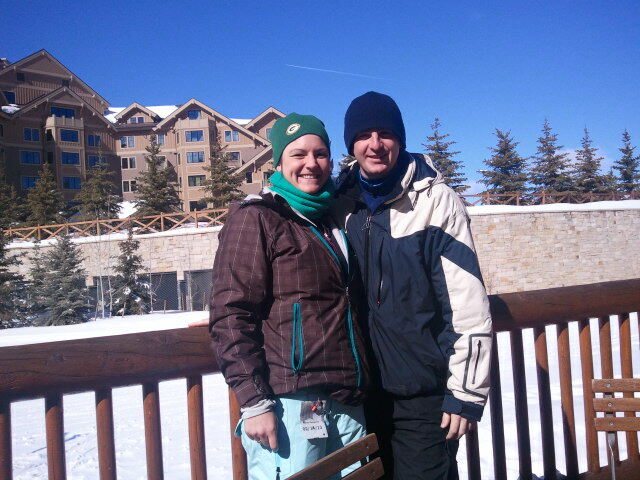 All this talk of skiing makes me want to plan another ski vacation right this minute. Okay onto April goals. I've decided to cut back my goals to only 3 from here on out. Having fewer goals will help me focus more on accomplishing those goals. In the last few months, I've had a hard time coming up with four to five goals each month (also might be why I've skipped months) and end up putting in a lot of "fluff" goals. Not that these are bad, but only choosing three will allow me to lead me to pick more meaningful goals. Goal 1. Nail the rest of marathon training. I've been struggling with motivation lately with training. Something that I will talk about more in my training recap of my last two weeks. This means getting in all the rest of my runs and also not dropping the ball on cross training. No skipping workouts because I am feeling lazy (injury or super soreness is a valid excuse however). Workouts will be shorter in the coming 3 weeks because I am now in the taper period so this goal is completely manageable. Goal 2. Plan 2013 race calendar. I've already done 2 unplanned races in 2013 and the marathon is obviously a big goal race for the year, but I also want to do a few triathlons. I need to sit down and look at my calendar for the summer and choose a goal half Ironman and several shorter triathlons. Although I try to clean regularly, some parts of my apartment get neglected and need a little cleaning TLC every now and then. Since spring is finally here to stay (I hope! ), it's time to dust off the cobwebs. I am already getting a head start on this by getting my carpets cleaned today! This is also a good time to go through my winter wardrobe and purge the things I don't wear anymore.